Joshua Morton is a veteran of United States Navy serving more than eight years as a Navy SEAL. Joshua became the first military working dog handler for SEAL Team Four. 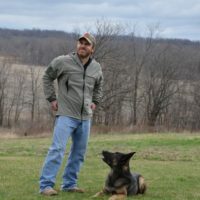 He served as a SEAL operator and canine handler during five deployments in Iraq and has extensive first-hand experience on numerous missions in the successful utilization of a canine in combat. Joshua is head trainer for the Belchertown Police Department in Massachusetts. The Windsor Heights Police Department, Polk County Sheriff's Office Patrol Canine Units in Des Moines, Iowa and contracts with the Polk County Jail in Des Moines for Jail services.